Note from the LeftEast editors: This is the first English episode of #TalkReal, a show that aims to explore the current possibilities and challenges before the left-wing movements in crisis-ridden Europe. LeftEast is happy to join in the media platforms which will be sharing the clips, including so far OpenDemocracy and ROARmag. After months of negotiations Greece reached a bad agreement with its Eurozone partners. The question “What comes next?” was widely discussed at the GCAS World Conference Democracy Rising in Athens (16-19 July), in which the interviewees of #TalkReal took part. As Markos Vogiatsoglou from the newly formed platform Europe Says OXI put it, the conference had become a “laboratory for the European Left’s today and tomorrow”: a spirit that the #TalkReal show also reflects. In this clip European Alternatives’ and #TalkReal’s Lorenzo Marsili asks Costas Douzinas, Margarita Tsomou, Srecko Horvat, and Jerome Roos the questions that concern us all: What should be done to relaunch a struggle for a democratic and just Europe? 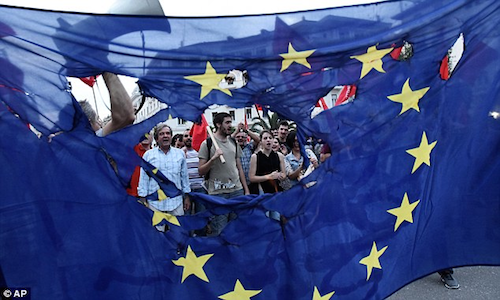 The speakers explore if Greece can become a catalyst for a wider European mobilisation.